In the US war for regime change in Russia, the Christmas dinner for the oligarchs was President Vladimir Putin’s idea in 2014 for demonstrating that he was in command of their loyalty for a price the oligarchs were afraid to test. Late last month, the dinner was turned into an afternoon tea ceremony in which the oligarchs confirmed for Putin the price he must pay if he isn’t to lose them to the other side. Mikhail Fridman and his Alfa Bank, Vimpelcom and X5 supermarket group demonstrated which side they believe to be strongest in this war by not attending. Their absence shows they calculate the risk of Kremlin sanctions for their business is now zero. The absence of Arkady Volozh, controlling shareholder of Yandex, the internet services company, reveals the same calculation. The presence of Anatoly Chubais, head of Rusnano, the state’s high-technology holding, the most pro-American of the oligarchs and one of the most hated of political names in the country, reflects the calculation on Putin’s side that there is now no oligarch price the President can risk not to pay. President Putin speaking from notes. To Putin’s right, Deputy Prime Minister Dmitry Kozak and Anton Vaino, Kremlin chief of staff. To Putin’s left, Finance Minister Anton Siluanov; Kremlin economic advisor, Andrei Belousov; Maxim Oreshkin, Minister of Economic Development. Despite his junior rank Kozak was making his first appearance at the oligarch event; a prime minister succession candidate in past years, Kozak is making a comeback after being sidelined by more powerful rivals. Belousov, a technocrat, is drafter of the “Belousov List” of investment projects which the oligarchs are being invited to finance in return for safe haven for their assets. 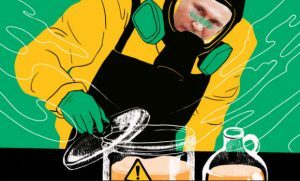 In 2014 the oligarchs’ priority was to get Putin’s agreement to shield them from sanctions by returning to Russia their assets, cashflow, and bank accounts without being inspected, taxed, or penalized. At the dinner table then, Putin said there ought to be a quid pro quo. If he agreed to shield their money in Russia, the oligarchs had to invest some of it in national welfare projects, a list of which Putin has been announcing publicly since then. No, the oligarchs said off the record. Protect us first, then we’ll invest. Putin conceded publicly, referring to “the now well-known proposal to introduce amnesty for capitals. If needed, we can discuss this aspect as well. Overall, I expect that we will have an absolutely free, informal, but business-oriented discussion today.” At that point in December 2014, he too went off the record. Three weeks ago, the terms of Putin’s deal with the oligarchs were still secret. 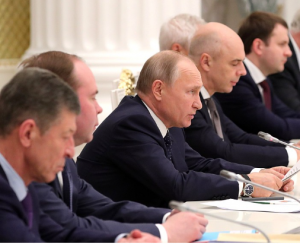 The court jester of the Kremlin, Kommersant reporter Andrei Kolesnikov (right), reported Putin was still asking the oligarchs “to share their excess profits with the state”. 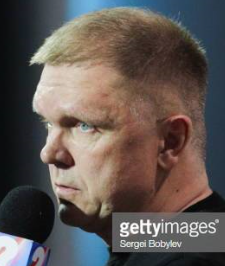 The reply, Kolesnikov claimed: “In general, the businessmen who gathered this time in the Kremlin seemed brisk and even, I don’t exaggerate, joyful. And there had to be reasons since a year ago there weren’t.” They hadn’t been forced to disgorge their profits or compelled to invest, Kolesnikov reported. There had been no “dispossession like kulaks”. The Kremlin has released the list of sixty business names attending on December 26; it appears in Russian, not in English. Those appearing for the first time include Igor Altushkin (copper); Ruslan Baisarov (construction); Oleg Belozerov (Russian Railways); Alexander Dyukov (Gazpromneft); Dmitry Konov (Sibur petrochemicals); the agroindustrial owner Vadim Moshkovich; two telecommunications executives, Andrei Kuzaev (ER-Telecom) and Mikhail Oseyevskiy (Rostelecom). Natalia Kasperskaya represented her husband Vadim Kaspersky; he had first appeared on Putin’s guest list in 2015. Since then his internet security business has been under US attack. Kaspersky has counter-attacked. 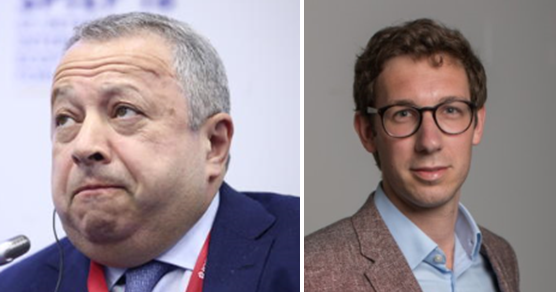 Russian press reporting claimed that Yury Kovalchuk and the Rotenberg brothers, the president’s well-known friends in business who are on the US sanctions list, were not at last month’s event. In fact, they have never been on the guest list since 2014. For reports on each of the gatherings, click to read for 2014; for 2015; for 2016; and for 2017; Chubais appeared for the first time in 2017. Participating in the December 26 Kremlin meeting, left image: Mikhail Prokhorov (left), with business rival Vladimir Potanin (right); Prokhorov has invested heavily in the US and has not been sanctioned. Right image: Anatoly Chubais(left) , who runs US investments from California headquarters, with Sergei Frank (right), whose Sovcomflot tanker fleet depends on US charter contracts. On top of their chairs there is a carved design of gilded leaves, not a display of gold coins. In advance of last month’s gathering, when the Kremlin was officially refusing to confirm whether it would be held or not, it was reported that Fridman and his Alfa group colleagues who had attended the oligarchs’ dinner in the past – Pyotr Aven, German Khan, Andrei Kosogov – would absent themselves this time around. The US Government reason for this was reported here. On December 27, the day after the event, Russian press reporting noted the absences of Fridman and Aven; Roman Abramovich of the Evraz group; Volozh of Yandex; Sergei Generalov, a transportation oligarch fallen on unfavourable fortune; Ziyavudin Magomedov, another transportation oligarch who is now in jail; and two state business executives, Sergei Chemezov of the Russian Technologies (Rostek) holding, and Vitaly Savliev of Aeroflot. A week after the event, a new reporter for the Financial Times bureau in Moscow discovered the story that some oligarchs were reluctant to attend the Kremlin; that was also two weeks after my report had appeared. The London paper headlined Henry Foy’s despatch: “Russia’s business elite seeks to play down Putin links — Threat of US sanctions poses dilemma for those with Kremlin connections”. Foy failed to discover the guest list in Russian on the Kremlin website; he didn’t know that Fridman and his men, Abramovich, and Volozh had been absent. Foy named his source Zakhar Smushkin, co-owner of the Ilim paper and pulp group with International Paper of the US. He told Foy he had no choice: “if [Putin] asks you to be there, you had better be there. It is not negotiable. You don’t know who you’ll be sat next to until you arrive.” Smushkin has been invited to the December meeting since 2015. Left, Ildar Smushkin; right, Henry Foy. Foy and his London editor, Neil Buckley, were asked by email to say if they had cribbed from this website’s December 18 report. Foy admitted reading the website, but denied cribbing.